When I was preparing for my road trip, I discovered that there are different types of lanterns, and they all have their own benefits and drawbacks. I honestly had no idea what I needed. I spent a while talking to a clerk at an outdoor gear store, and ultimately chose a Coleman lantern. This is not to say the Coleman lantern isn’t a perfectly fine lantern, and one that would be right for many people. But for me, a solo camper, it was wrong. While in the store, the clerk explained the benefits of the Coleman (and other liquid fuel lanterns) which include the fact that it produces a good, bright light, I could share the fuel with my (borrowed) Coleman camp stove, and it was very economical. Once out actually camping, however, I discovered it wasn’t right for my situation. I had to figure out how to light the mantle, and the lantern got very hot. The main problem, however, was that since I couldn’t use it inside the tent, I only used it if I was hanging around outside my tent at night, and I didn’t do that more than twice. As a solo camper, I was either going to be hanging out at other people’s lit campsites or in my tent once it got dark…especially once my body adjusted to going to sleep early and waking up at dawn, which happens naturally when you camp for long periods. So I learned my lesson. And now, so can you. My recommendation for the solo camper — especially one just starting out — is to go with a battery-powered lantern, preferably a self-charging or an LED lantern. There are drawbacks, sure, but you’ll get more use out of it than a liquid or gas fueled lantern. Liquid fuel lanters use Coleman fuel, unleaded gas, or kerosene — some newer lanterns can use both Coleman or unleaded gas, which is a convenience. These lanterns are a longtime favorite of campers, because they produce a very bright light (much brighter than battery power), and therefore can light a wider area. The drawbacks are that they get very hot, you’ll need to deal with this mantle business, and you can’t use them inside your tent. Cost of Coleman fuel canisters is under $10 for two, and they will provide hours of burn time (though the estimates vary from 4 – 14 hours). Like liquid fuel lanterns, gas fuel lanterns produce a very bright light. Like liquid fuel lanterns, gas fuel lanterns get very hot when used, and cannot be used inside a tent. Like liquid fuel lanterns, gas fuel lanterns use canisters and mantles. If you’re going to go with a liquid or gas fuel lantern, choose the one that shares fuel with your stove, for convenience sake. Cost of liquid and gas fuel lanterns varies from around $50 to $100. 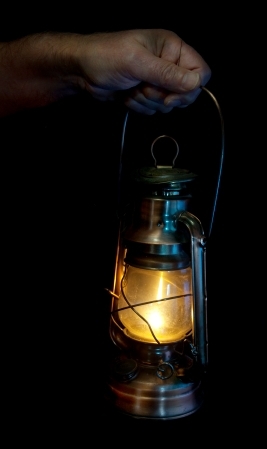 The major drawback to a battery-powered lantern is that it doesn’t produce a light anywhere near as bright as a liquid or gas fuel lantern. If you get one that is non-rechargeable and runs through a lot of batteries, it’s also not the most eco-friendly device. The major benefits, however, are that it is clean, safe, and easy to use, and — major bonus points here — you can use it in your tent. Battery powered lanterns also tend to be less expensive than liquid or gas fuel lanterns, between $20 and $50. There’s not much to be done about the brightness of the light. However, there are now several kinds of battery lanterns that are a little friendlier to the environment. LED lanterns cause less drain on batteries, lasting longer (and creating less battery waste). Self-charging lanterns use a wind-up or hand-crank to recharge the battery.